Just how long is Migos’ brand new album Culture II? The Atlanta trio behind 2017's No. 1 hit “Bad and Boujee” released their third studio album Friday and it isn’t quick listen. At all. It’s 105 minutes over the course of 24 tracks, and if you think of that in terms of air travel, Culture II is shorter than a flight from Seattle to San Francisco (130 Minutes); but longer than a flight from Atlanta to New Orleans (95 Minutes). That’s a lot of Migos—rappers Quavo, Offset, and Takeoff—to consume in one setting. Perhaps even a little too much? Long albums are certainly no new trend in rap music. The ‘90s brought about a bunch of huge, double albums from rappers like Biggie Smalls (Life After Death, 1997), Master P (MP da Last Done, 1998), and Tupac (All Eyez On Me, 1996). In the current hip hop landscape, Drake’s last two albums, 2016's Views From the Six and 2017's More Life, both, were over 80 minutes long. Migos, to their credit, are just following a long tradition of excess. While there’s no denying that Culture II is super long, you could...do a lot of things while it plays. Here’s a handy guide of activities that take less time than listening to Culture II. You’re welcome. If you’re into international travel, I suggest booking a flight from London to Paris. Not only could you see two iconic cities, you’d arrive 30 minutes before the album ends—plenty of time to go through international customs. 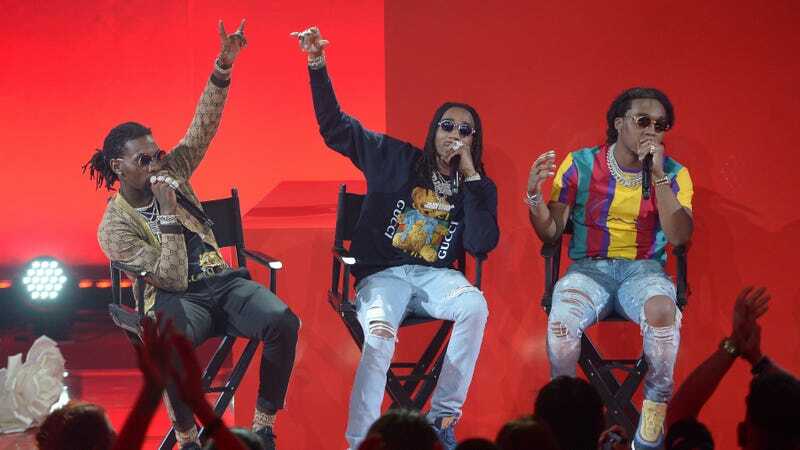 Migos are fairly aware of their place in the mainstream music world...or Culture, as some might say. Still, 105 minute is a long for an album, especially in this day and age. In fact, it’s longer than any album that’s won Album of the Year at the Grammys this decade. If you go back far enough, only two Album of the Year winners in the Grammys’ 60 years have been longer than Migo’s Culture II—Judy Garland’s Judy at Carnegie Hall (1962) comes in at nearly 123 minutes, and Outkast’s Speakerboxxx/The Love Below (2004) goes on for nearly 135 minutes. I will not argue that this Migos’ album won’t stand the test of time, but I will say that the trio might not be holding a gold trophy next Grammys season. My last recommendation is simple: A nap. A quick snooze can take on different durations, but they’re certainly shorter than an 105 minute-long album. I’m not a trained doctor, so I won’t tell you how long to sleep, but no matter what variety nap you take, Culture II is longer. It’s so long, guys.